Hi! Hey! Hello there! That was the beginning to the Big Jon and Sparkie, a daily 15 minute children's show featuring Jon Arthur (Big Jon) and Sparkie, "an elf from the land of make-believe, who wanted more than anything to be a real boy." In addition to the daily show, they also had a two-hour show on Saturday mornings called No School Today. 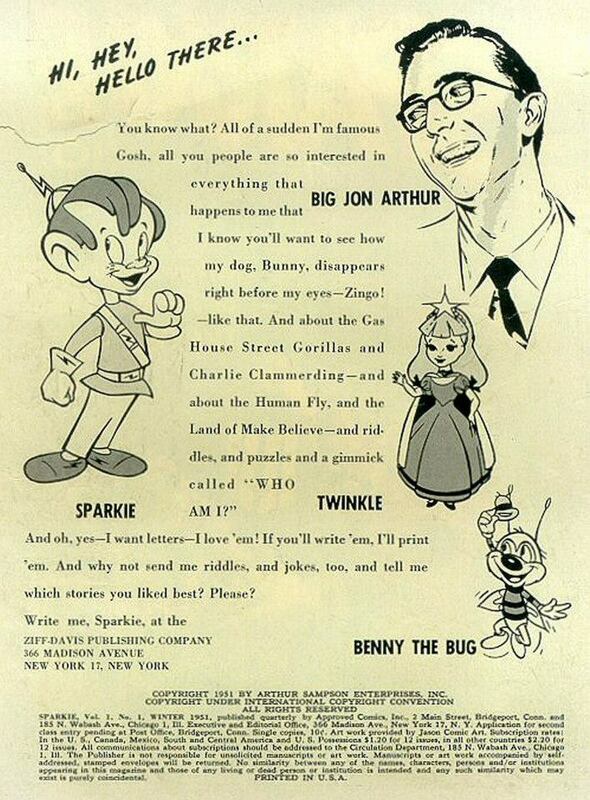 Big Jon and Sparkie featured a huge cast of characters over its run from 1950 to 1958. The shows enjoyed a revival in the 1970s introducing a second generation of children to Big Jon and Sparkie. 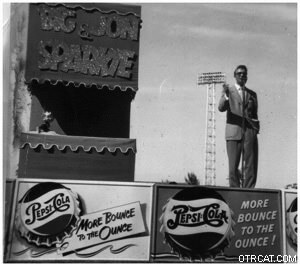 Old Time Radio has 98 Big John and Sparkie shows available on CD. Listen to the sample broadcast and go back to simpler times with Big Jon and Sparkie. With the strains of The Teddy Bear's Picnic, kids knew that they were in for a great time with Big Jon and Sparkie. One of the things many people remember today is the birthday song played at the end of the show to recognize bids who were having a birthday. Many parents sang this song to their children well after the show was no longer on the air and those parents were children when they heard it. 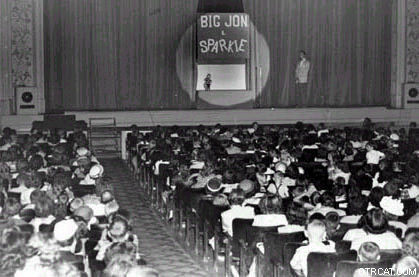 In the 1970s, Big Jon and Sparkie was introduced to a new audience in some areas when local radio stations began playing the show. Big Jon and Sparkie was actually two shows, Big Jon and Sparkie and No School Today. No School Today aired on Saturday mornings for two hours and Big Jon and Sparkie aired daily for 15 minutes. 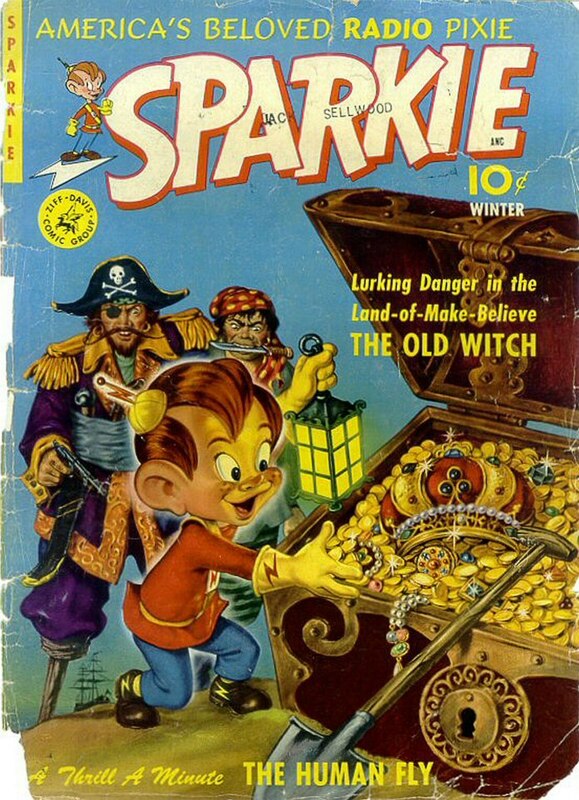 Big Jon and Sparkie was more of a serial with adaptations of classic books like Treasure Island or original adventures adapted from Arthur's children or suggestions from listeners. 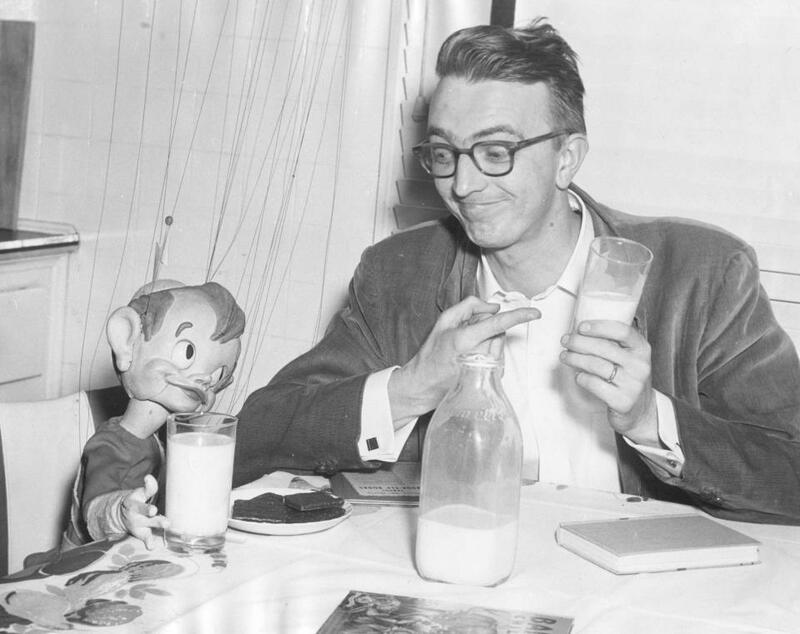 Because of the two hour format, Jon Arthur, the Big Jon in the title and the show creator, No School Today featured adventures with Sparkie, a bit of teaching. He even encouraged kids to keep their room clean and had them line up in front of the radio to use his "magic spyglasses" to see into their rooms. Jon Arthur was the voice behind most of the characters. By 1954 or so, he estimated that he performed over 200 voices on the show. To create Sparkie's voice, Arthur recorded his own voice then played it back at a fast speed. Even though guests appeared on the show, Arthur voiced Mayor Plumpfront, Ukey Betcha, and bunches more. 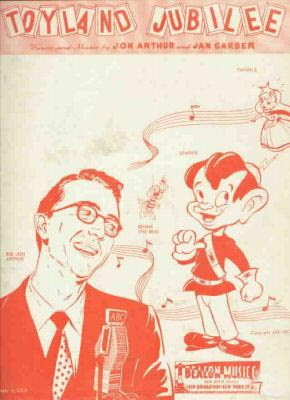 For several years, Sparkie was just a voice on the radio. After many requests, Arthur announced a contest to design Sparkie's. He received thousands of letters after only two appeals on the radio for descriptions. 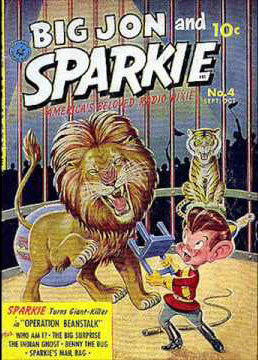 Arthur then hired comic book artist, Leon Jason to create Sparkie's likeness. Arthur took Sparkie on the road generating some very fond memories for people. Big Jon - He was Sparkie's "father". He taught Sparkie about how to act and generally guided him through life. When Sparkie didn't want to attend Mayor Plumpfront's wedding, Big Jon helped Sparkie work through his feelings and attend the wedding. Sparkie - He is an elf who wants to be a real boy more than anything in the world. During his time on radio, he visited Africa, went to Florida, and helped solve a kidnapping. The Mayor's new fiance, Daffodil Dilly. Mayor Plumpfront - The mayor of Cincinnati. He participated in many of the adventures and played a large role in the show. Daffodil Dilly - The mayor's fiance and later his wife. Ukey Betcha - Friend to Sparkie and a funny cab driver. The Big Jon and Sparkie Show and No School Todayshows were created, hosted, and acted by Jon Arthur (Jonathan Arthur Goerss). Arthur voiced all of the characters on the show including Sparkie, Mayor Plumpfront and almost everyone else. Arthur was the son of a Pittsburgh, Pennsylvania minister. From his home in Pittsburgh, he took a radio course eventually landing his first radio job at WJLS in Beckley, WV. He started performing completely by accident. When an act did not show up for a scheduled performance, Arthur when on the air performing his own version of the children's story The Three Little Pigs, playing to two children who were watching from the observation booth. That was the foundation for the Big Jon and Sparkie show. 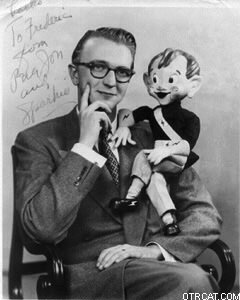 The show first appeared in 1947 on a local station in Cincinnati, perfecting the show by 1950 when it premiered on ABC. 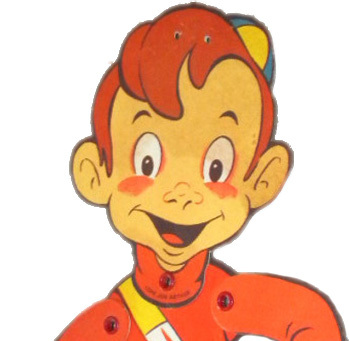 Both shows, Big Jon and Sparkie and No School Today, stayed with ABC until 1958. It is hard to find information about Jon Arthur. One thing we know for sure is that Arthur had one daughter who appeared as "The Little Girl Next Door" on his shows, he married a woman from West Virginia. After Big Jon and Sparkie, Arthur continued working in radio. He died in 1983.